A bowsprit would improve performance, and some boats put a spi pole on deck to act as a short sprit. 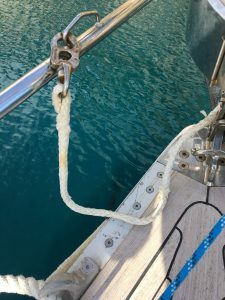 I just use a tack line from the foot of the forestay. Lars – Is there a turnbuckle with handles inside the babystay shroud roller? if not, you can either have one made (I can send drawing) or you take a look at Wichard tensioners. If I guessed at the other fitting it was probably trying to rig the pole as a sprit to fly asymmetrical spinnakers.